Is it really December already?! Where has the time gone? November was another extremely busy month for us. Among the usual madness it was also Ewan’s birthday and Thanksgiving of course. Now it is already time to get ready for Christmas. Some day things may calm down a little, hopefully in January after the holiday break. So a new month brings a new In My Kitchen post, thanks to the lovely Celia at Fig Jam and Lime Cordial. Here’s what has been happening in our kitchen…. 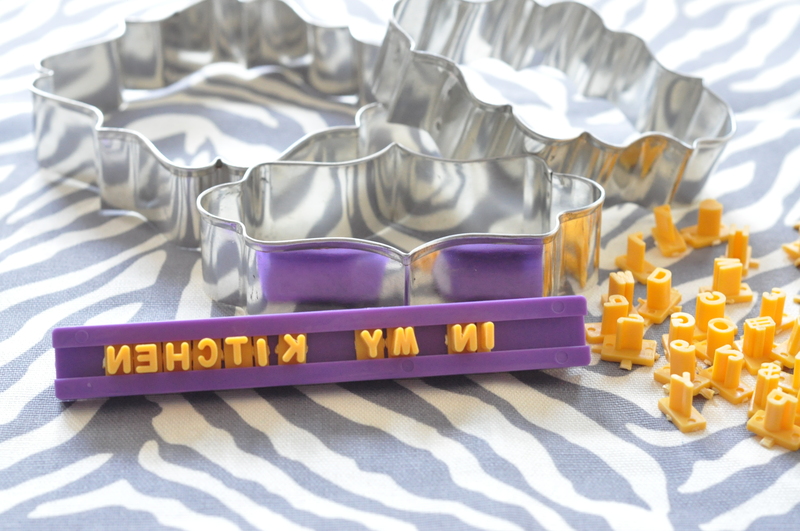 First off is this set of letters, numbers and symbols to stamp cookies along with some new cookie cutters. We have already used them several times. I used them to stamp the cookies used in our new header. In the header the images were too small so I had to type the text over the cookies, but if you look closely here the cookies are stamped. I also used them to make farewell cookies for the aquatics director at our gym. We already miss our dear Miss Lindsay. She started Jack and Ewan with private swim lessons when they were nearly three and four years old and has helped them grow and improve. They love to swim thanks to her. 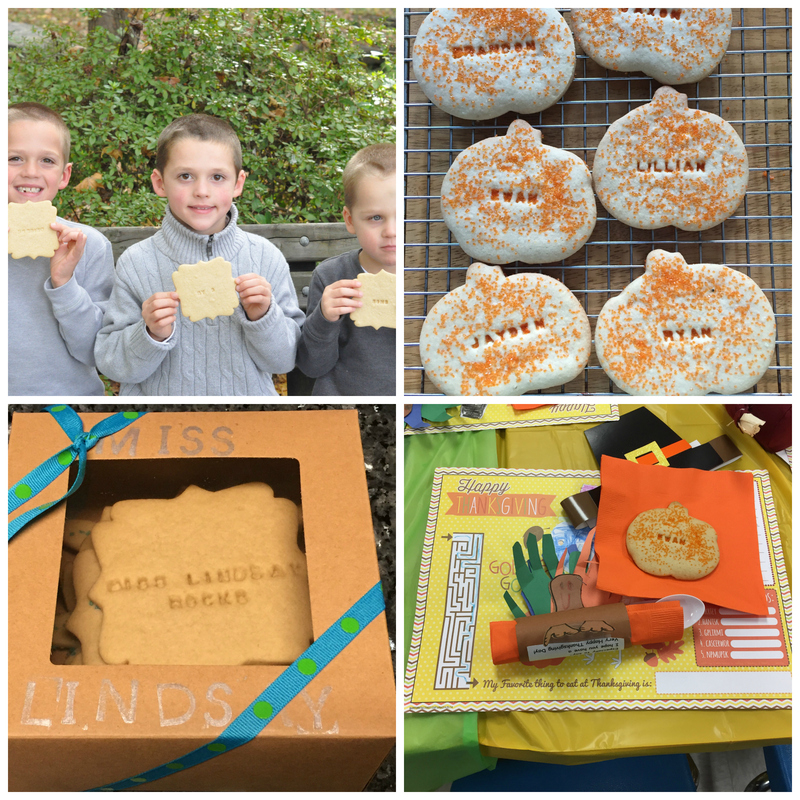 Finally, I stamped the name of each child and teacher in Ewan’s class for his Thanksgiving program on a pumpkin cookie sprinkled with orange sugar. They were the centerpiece of each placesetting. The kids were all surprised and excited. Okay, this isn’t in my kitchen. There is a food story behind it though so I thought I would include it. Several weeks ago Sean and Ewan were playing in the garden. The only things left in there were a huge squash, cucumbers and the peppers. They somehow decided to play with the peppers. They picked several and did who knows what with them. I can say for certain that they opened up the peppers. First Ewan came running and crying in the house, his eyes hurt. He obviously rubbed his pepper hands on his eyes and they burned, badly. Josh and I calmed him down and got some eye drops in. While Josh was trying to calm him a little more Sean came running and crying in, his mouth hurt. So I washed him off and when I turned to get a towel he rubbed his eyes, before I washed his hands! 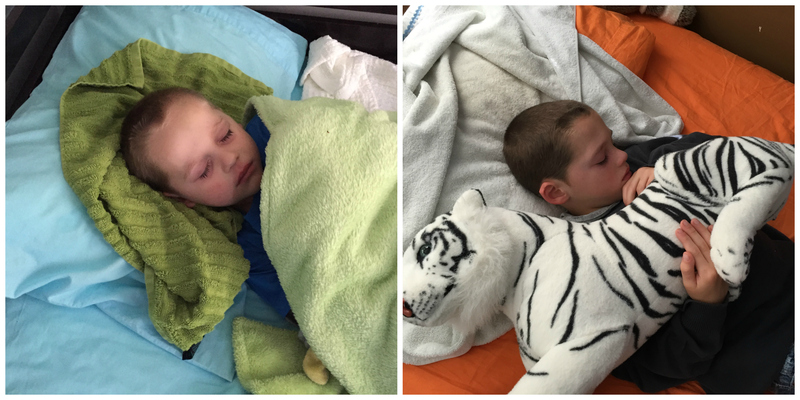 After more eye drops and many tears shed, this is a photo of the boys napping after their pepper ordeal! I’d like to say they learned their lesson, but somehow I’m not so sure of it! Then we had Ewan’s sixth birthday. He is our foodie and had a fantastic day. 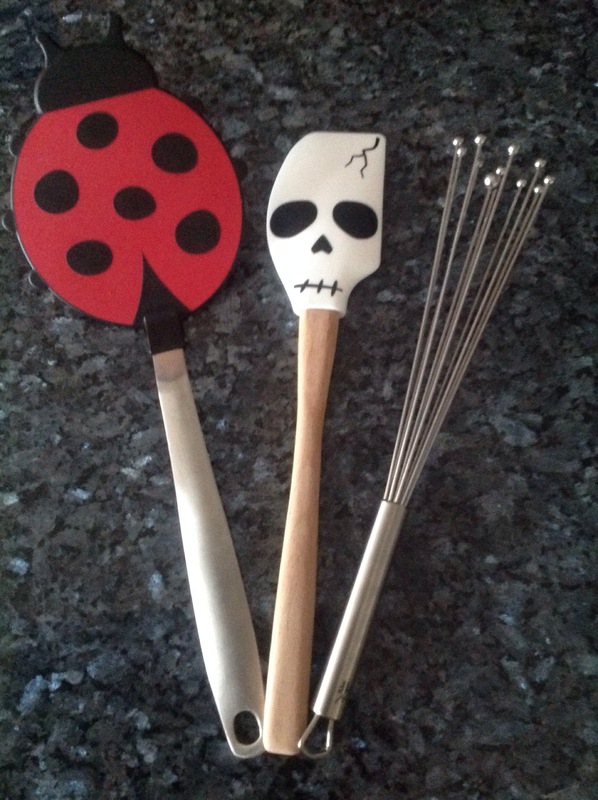 It started with opening his presents from Mom and Dad….the kitchen utensils he requested! He then started helping make French toast using his whisk and flipping with his laydybug spatula. He was incredibly excited! 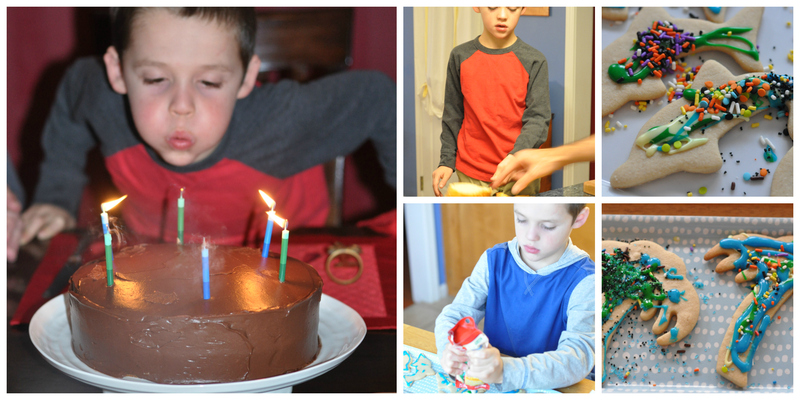 He also used his utensils to help make his birthday cake, yellow cake with chocolate frosting. Like his brothers, he got to decorate his own cookies too, he chose dolphins and palm trees. I couldn’t do a December post without an introduction to Christmas. We were out of town for Thanksgiving weekend and didn’t return home until November 30. That left me the morning and early afternoon of December 1 to throw together this Advent calendar for the boys. Nothing like last minute stress! 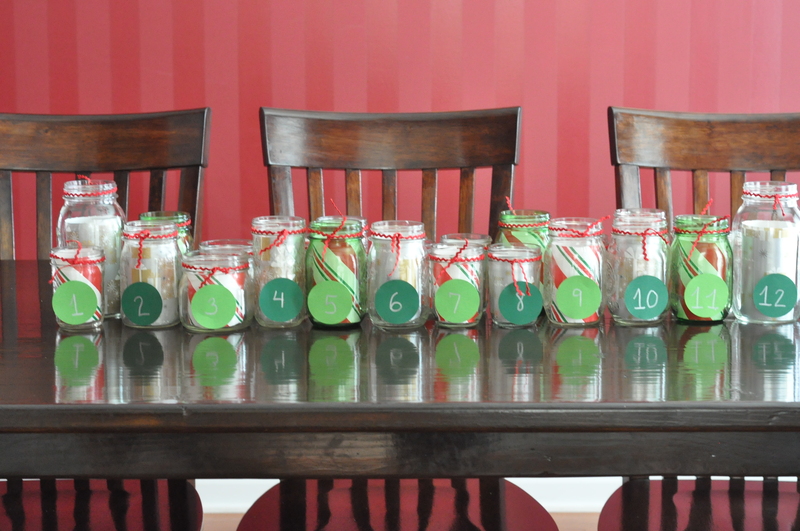 I used several sizes of canning jars, lined them with Christmas paper, tied a ribbon around the top and added the numbers on the outside. Every night after dinner the boys get to pick out what is in the jar for that day, anything from pencils to stickers, candy, clementines, etc. So that sums up what has been happening in our kitchen and lives this past month. It was so hectic many of this month’s photos were taken with my iPhone or iPad, also in the dark hours of the morning or night so I apologize now for the quality. December the madness continues with Christmas preparations. The boys and I are working on our list of cookies we want to bake, along with all the other goodies. We have Christmas brunch and dinner figured out too. What is happening in your kitchen? To see what everyone else is up to check out the list at Fig Jam and Lime Cordial. This entry was posted in In My Kitchen and tagged Advent calendar, cooking with kids, personalized cookies on December 3, 2014 by Gretchen. Ohhhh, the chilli peppers. Such a steep learning curve on that one. The letters for the cookies are very fun looking and so is your Advent Calendar idea. Thanks for posting, enjoy the holidays. Thanks so much! We’ll see if they remember their pepper incident next year. Enjoy your holidays as well and see you in the new year for more IMK posts. Thanks for stopping by. I am loving all the possibilities of personalized cookies! I can’t remember exactly where I got the stamps, ordered from some baking supply company here in the States. Luckily they are so small they will fit anywhere! They are so fun and the possibilities are endless. Thanks for stopping by, Gretchen. I hear you on being tired at night! Luckily we go to bed, we have to given the early hours. The boys are FINALLY breaking through their habit if waking at 5:30 every day. That went on for a couple weeks! I have the cards in my possession, just need to address and get them out. Whatever gets done gets done, it’s quality time with the family that counts. Happy Holidays Liz! The boys certainly keep me busy and on my toes! Happy Holidays and thanks for stopping by our kitchen! I keep debating whether to get the letter press set for the cookies. I love your advent calendar! Poor babies with the chillies. Just be grateful they didn’t go to the bathroom – that would have been a whole lot of pain! Thanks goodness they hadn’t gone to the bathroom, not sure I could have handled that without laughing! The advent calendar was fun, last year it was Chinese takeout boxes with festive washi tapes and numbers. Also fun ideas to find on Pinterest. Thanks for stopping by. The personalized cookies are such fun, I already have holiday ideas! 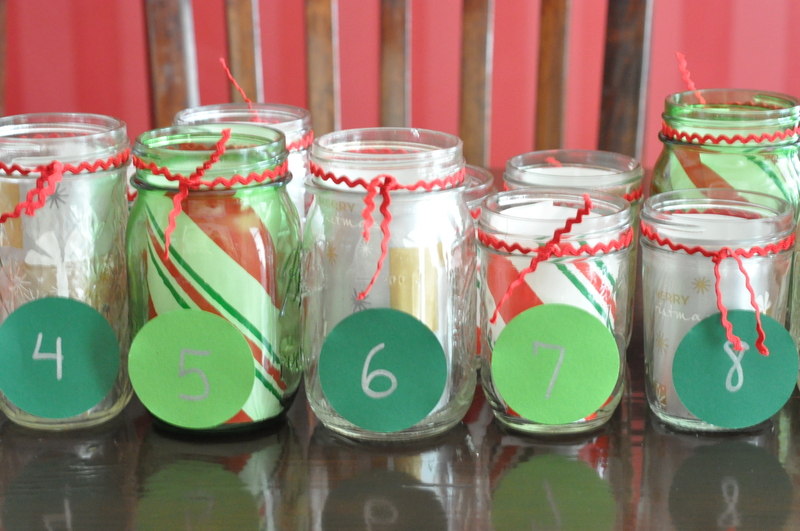 The advent calendar was another Pinterest find. Last year we used Chinese takeout boxes and decorated them with red and green washi tapes. Thanks for popping by out kitchen. One if them already didn’t like spicy things! It’s always an adventure with those boys. Matchboxes for an advent calendar sounds brilliant, something to think about for future years. Thanks for peeking in our kitchen. Thanks Amy! I love the stamps too and have plans for Christmas cookies using them. Thanks! I am looking forward to all the meals the boys will fix for me. Hopefully breakfast in bed soon enough, with a little more training! Hopefully your little one will stay away from peppers! The adventures never end with boys! Little ones at Christmas certainly,do make things a little more exciting. I love their enthusiasm. Thanks for stopping by. i love that your little boy wants kitchen gear for presents. that is so cute. here’s hoping he makes you many cakes etc. love your cookies with the stamps. have a great xmas. Thanks! Ewan is my foodie and love to help in the kitchen. I am also thrilled he wants kitchen gear. Someday he will be able to fix me breakfast in bed!! Oh chilli in the eyes is not fun. Poor fellows!! oh well it is not long lasting. I love your cookie stamps too. Such fun. They managed to get over the pain, especially after a nice nap! I am loving the cookie stamps. Thanks for stopping by. I’m sure the boys will still have pepper incidents in their future! As for Ewan, he is my best sous chef and I do my best to encourage it. He absolutely loves his new kitchen utensils! Oh your poor boys with the chillies. What an excellent idea for an advent calender – love it. We have fun trying out different advent calendars every year! Thanks for stopping by. I can imagine how crazy your month has been, I’ve seen your posts! Things are crazy busy here as well. I hope you enjoyed your holidays and have a Happy New Year. The cookies get stamped before they go in the oven, a few letters are sometimes tricky.